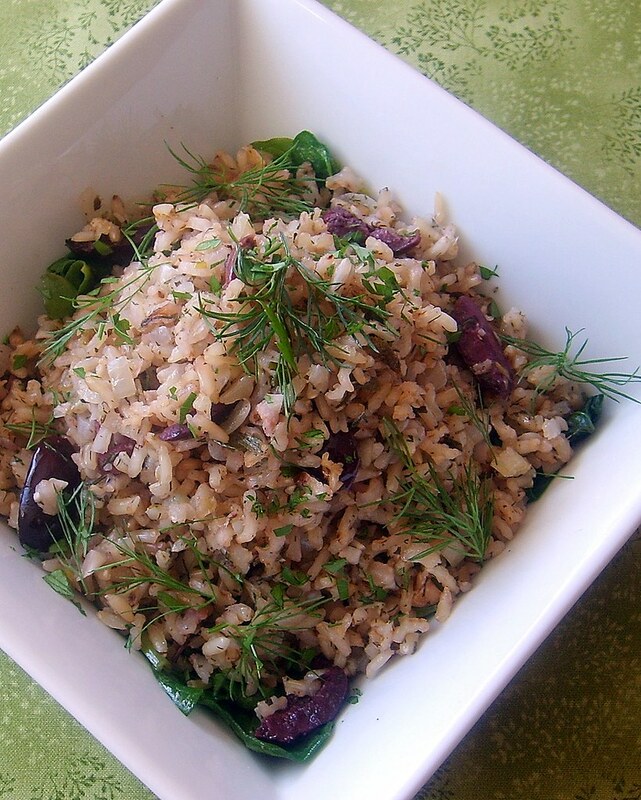 I've been making this Greek rice pilaf recipe for many years. I use it to stuff grape leaves, Swiss chard, Napa cabbage, bell peppers, zucchini, eggplant and tomatoes. Tonight, I served it with sauteed spinach with minced garlic, olive oil and lemon juice. It also goes great with my Tahini Mint Sauce. Heat a 2qt sauce pan on medium, add 1-2 tsp extra virgin olive oil, add brown rice and cook until lightly golden brown, about 3 minutes. Immediately add water, 1/2 tsp salt, bring to a boil, reduce heat to medium low and cook 35 minutes. Remove from heat and let sit for 10 minutes longer. Fluff with a fork and set aside. In a large saute pan heat remaining olive oil on medium, add onions and celery and cook for about 5 minutes until onions are soft. Add garlic, dried oregano and cook for another 2-3 minutes longer. Add cooked brown rice, sunflower seeds, mint, dill and stir to combine. Fold in Kalamata olives and finish with fresh lemon juice. Check seasonings and add salt and pepper if needed.